With the service launching in the United States last month, it may seem a little late, but Apple has very recently launched a website dedicated to iTunes Match. 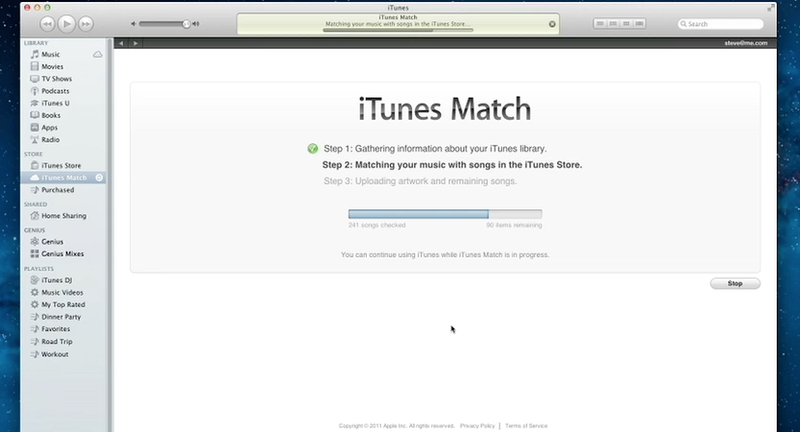 Previously, iTunes Match was given a slab of the iTunes in the Cloud website. The company then explains how the service works by detailing the song matching and uploading process. The new website, also spotted by AppleBitch, features a clear setup guide, FAQ, and walkthrough video – three things that publications have taken to themselves to create. Apple seemingly wanted to create their own so users have the clearest explanation possible directly from the company. Apple also posted answers to frequently asked questions, settling the downloading vs. streaming debate, and clarifying other concerns such as what happens to songs when your one year iTunes Match subscription expires. Read on for the full FAQ and Apple-made iTunes Match walkthrough video. Who can use iTunes Match? Anyone with an Apple ID in the U.S and select other countries can use iTunes Match. You also need iTunes 10.5.1 or later on your Mac or PC and iOS 5.0.1 or later on your iPhone 3GS or later, iPod touch (3rd and 4th generation), or iPad. Which music formats can iTunes Match handle? You can match or upload music formats that can be played with iTunes. That includes AAC, MP3, WAV, AIFF, Apple Lossless, and more. How many devices can iTunes Match support? iTunes Match supports up to 10 devices — including your computer, iPhone, iPod touch, iPad, and Apple TV. Will my playlists sync across devices? Yes. When you create, edit, or delete a playlist on your Mac, PC, iPhone, or iPad, those changes will sync across any iTunes Match-enabled device you own. However, playlists with videos, voice memos, or PDF files will not sync. Does iTunes Match stream or download songs? On a computer, any songs stored in iCloud will stream over the air when played, though you can download them at any time by clicking the iCloud download button. iOS devices will start playing tracks from iCloud as they download and will store them so that you can listen to them later even if you don’t have a network connection. Apple TV only streams songs. Yes. Go to Settings > Store on your device. Turn on Use Cellular Data. If you’d rather download over Wi-Fi, turn it off. What if I add new music to my library? Do I need to tell iTunes Match to scan it? No. iTunes Match will automatically rescan for content, so you don’t have to. Although you can force a refresh by choosing Store > Update iTunes Match in iTunes. What happens if I don’t resubscribe after the first year? Will I lose any upgraded songs? No. Any songs you’ve upgraded or downloaded again are completely safe. The only thing you lose is the central storage — iCloud will no longer stream or download matched or uploaded songs to your devices. On a Mac or PC, open iTunes and choose Store >Turn On iTunes Match. Then turn on your iOS devices, tap Settings > Music > Turn On iTunes Match. To turn on iTunes Match on Apple TV, go to Music > iCloud Library. No. If you’ve been using a separate Apple ID for purchases, that Apple ID will also work for iTunes Match. You should use the Apple ID that is associated with the majority of your music purchases. Apple also posted their own walkthrough video that shows how to setup iTunes Match on iTunes on the Mac and then how to access your music on an iOS device like an iPad or Apple TV. You can click here to watch the video. Apple posted a support document last week that details iTunes Match availability across the globe.